The Central government today approved an ordinance to stop sealing of illegal structures in Delhi, including thousands of slums and hundreds of unauthorised colonies. Many BJP workers and leaders gheraoed the Assembly today. They demanded the regularisation of unauthorised colonies, stopping of sealing and demolition drives. 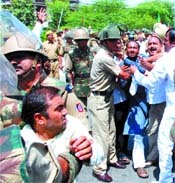 Many of them were arrested while, they were moving towards the Assembly from the Chandgi Ram Akhara. As the Ram Setu controversy has flared up religious sentiments of many Hindu organisations, a section of Delhi University academics has termed the ASI statement blasphemous. The issue of signature bridge raised by the BJP on the second day of the monsoon session, in the Delhi Assembly, resulted in a din today, when Congress MLA Bheeshm Sharma pushed down BJP MLA Sahib Singh Chauhan. With Ramzan beginning in India on Friday, shops and eateries in Muslim-dominated areas like the walled city here are decked up for the nightlong bustle through the holy month as the devout throng the area - with the fragrance of ittar permeating the atmosphere. Delhi Pradesh Congress Committee (DPCC) president Jai Prakash Agarwal has said that his priority was to strengthen the party in the state. He took charge of president of the state party from Ram Babu Sharma at a function here today. Agarwal, Rajya Sabha MP, promised to take all the party workers along to consolidate the reach of the party. The iron gate of the Hindon barrage collapsed yesterday with a loud thud, in view of the increased water pressure in the river. As a result, water supply to the Hindon canal, Badarpur power plant and Agra canal from the Yamuna has stopped. India has around 836 million poor people and has the worst maternal and infant mortality rates. Besides, it has the largest number of people without an access to education, according to the Oxfam. The Oxfam launched a global campaign, 'Health and Education for All' here today, calling for an investment of over Rs 6 million more on teachers, nurses and doctors around the world. Welcoming the power minister's statements, members of the United RWAs Joint Action (URJA), Delhi's largest confederation of RWAs said that they expected more effective statutory checks on the powers of the Discoms, which had led to an abnormal situation. It was a step back in time for India's communist veterans. The heyday of the Left revolution was relived and leaders who made it possible flickered on the screen, as the present day apparatchiks watched a film on the life and times of legendary left leader A.K. Gopalan Nambiar. In a series of busting drug traffickers in the Capital, the narcotics branch has held a foreign national involved in cocaine trade. An information was received that an African national, presently living in Mumbai was involved in the illicit trade of cocaine in Delhi and Mumbai. Bhure Singh, a police constable committed suicide by hanging himself at his residence in Karawal Nagar. The 45-year-old constable was found dead early in the morning today. The cause of his suicide is expected to be his wife's illicit relationship with their tenant. Two daughters and two sons survive the victim. Seven persons were arrested yesterday in two separate robbery attempts. Delhi Mayor Arti Mehra today gave a grant of Rs 2.5 crore to five gosadans being run by non-governmental organisations where stray cows caught during raids conducted by the MCD have been kept. Naftogaz India private limited, a subsidiary of the NJSC Naftogaz of Ukrain, has been allotted two major contracts for Bharat Oman Refineries Limited, Bina Refinery Project being implemented in Bina, Madhya Pradesh. The value for the Hydrogen Generation unit contract is Rs 576 crore while, the contract for Coke Drum System Package is Rs 255 crore. The combined value of both the orders is Rs 831 crore. The National Capital Territory of Delhi Laws (Special Provision) Second Ordinance, 2007, received the approval of the cabinet and will provide status quo in respect of the sealing drive in several colonies. The first ordinance was tabled before Parliament last year when the master plan was under process. According to the provisions in the ordinance, unauthorised developments like "slum clusters, hawkers and urban street vendors, unauthorised colonies, existing farm houses, involving construction beyond permissible building limits" will get a reprieve from the day of the ordinance's promulgation. It would also give relief to "schools, dispensaries, religious institutions, cultural institutions, warehouses and godowns agricultural land", and more importantly "commercial establishments in unauthorised colonies". Currently, as per a Supreme Court direction, "unauthorised developments" were to be shut down by the civic authorities. Civic officials said, as soon as the ordinance was notified they would stop the sealing drive. "We have not received any direction so far but for sure the sealing will come to an end after the declaration of the ordinance," said an official of the Municipal Corporation of Delhi (MCD). CAIT secretary general Praveen Khandelwal said that the government had accepted the demand of trading community to bring unauthorised colonies under the domain of one -year moratorium bill. But now the government should accelerate the process of regularisation of such colonies and needed guidelines should be framed without any loss of time so that the sword of sealing may not fall on such colonies. Delhi is governed by multiple government agencies and as such to ensure effective and timely implementation of Master Plan 2021, the government must constitute a special task force comprising senior officials of the Delhi government, MCD, DDA and other related agencies for better coordination, he said. The party workers shouting slogans against the Sheila Dikshit government in the Capital assembled at the Chandgi Ram Akhara. They moved towards the Assembly in the leadership of Prof Vijay Kumar Malhotra, Dr Harsh Vardhan, Vijay Goel, Prof Jagdish Mukhi, Pawan Sharma and Alok Kumar. Addressing the gathering, Malhotra said that the Centre by making provision for providing relief to unauthorised colonies in its Bill should immediately implement it, so that the sword of demolition and displacement hanging on the residents of unauthorised colonies might be removed. BJP Delhi Pradesh president Dr Harsh Vardhan said that most of the residents of unauthorised colonies were 'Poorvanchalis'. The Congress government in the Capital wanted to displace them from here, alleged Vardhan. He added that the Central and state governments were hand in glove. On one hand they make assurances for the regularisation of unauthorised colonies while, on the other, they frame such stringent rules that people residing in those colonies might be compelled to sell their land to the builder mafia at cheap rates. Prof Jagdish Mukhi, opposition leader in the Delhi Assembly alleged that the government had ruined trade and commerce in the Capital and had decided to inflict atrocities on unauthorised colonies and villages. The BJP will not allow the implementation of any anti-people decision. The national secretary the party, Vijay Goel said that the government would not be allowed to ruin unauthorised colonies. The BJP will give befitting reply to the Congress. The government should regularise all unauthorised colonies without wasting time, he demanded. The NCP media convener and lecturer at DU, Suraj Yadav, along with several other lecturers have criticized the statement of the ASI affidavit in the Supreme Court which stated that there was no historical proof of Lord Ram. Academicians have declared this statement blasphemous and historically untrue. They feel that the ASI has not been able to corroborate many historical facts and as such their existence cannot be denied. Lecturers have requested the government of India to make a proper study on the matter with experts from the departments of history, environment, geology, geography and astrophysics before going ahead and breaking the Ram Setu. The academicians feel that this is not simply a matter of Hindu faith as a section of the people are projecting but also a matter of environment and of possible national heritage from a very ancient period. Chauhan wanted to know the plan of the construction of signature bridge, which angered Sharma. Reacting to Sharma's attitude, the opposition members came into well of the house and demanded action against the MLA. The Speaker, Chaudhary Prem Singh immediately directed the MLA to leave the house, but it did not satisfy the BJP MLAs. They demanded his ouster from the entire session. Subsequently, the speaker adjourned the house. When house assembled, the BJP members continued their demand, which led to the adjournment of the house for the next consecutive day. The BJP members led by Prof Jagdish Mukhi said. The ninth month of the Islamic calendar, Ramzan, is an Islamic religious observance when the Quran was revealed. In this month, Muslims observe daylong fasts, from dawn to dusk. "During Ramzan, the nights come alive with hustle-bustle and a lot of activity. Before sunrise, people wake up and have a small meal and then recite a short prayer. Men go to the mosques for the early morning namaz as well," said Salma Rahman, who has been observing the fast every year with devotion. "During the course of the day, we don't eat even a morsel of food or drink a drop of water. Only after sunset do we break our fast, again with a short prayer and thereafter feast on a variety of dishes," she said. Generally, fasts are broken by eating a date, following the tradition set by Prophet Mohammad. In areas surrounding the Jama Masjid, the eating joints get flooded before sunrise with customers, who come to have an early breakfast, and then go for their morning namaz (prayers) to the mosque. The Iftar, or the meal that people have after sunset when they break their fasts with a prayer, is elaborate and lavish. The fragrance of seekh kababs, degchis (huge vessels) of nahari and paaya (tender trotters that are simmered all night in their own juices and mouth watering masalas) and bowls of thick pudding emanating from the tiny restaurants dotting the place invite the devout to have their iftar there. "It's not just fasting that Muslims are expected to observe during Ramzan. They are also supposed to be more observant of the teachings of Islam, practice generosity towards the less fortunate, refrain from anger, greed, lust and lies, and read the holy Quran," said Mohammad Anwar. "The idea behind the month-long fast is to redirect the heart from worldly activities, cleanse the soul and bring an inner peace and calm," he said. Delhi Pradesh Congress Committee (DPCC) president Jai Prakash Agarwal has said that his priority was to strengthen the party in the state. He took charge of president of the state party from Ram Babu Sharma at a function here today. Agarwal, Rajya Sabha MP, promised to take all the party workers along to consolidate the reach of the party. He exhorted the party workers to work towards strengthening the Congress as his aim was to keep the party flag fluttering high. The party would leave no stone unturned to popularise the achievements of the Central and state governments. Prominent among those on the occasion were All India Congress Committee general secretary and in-charge of Delhi Affairs Ashok Gehlot, Congress Working Committee member R. K. Dhawan, AICC secretary J. D. Seelam, Major Ved Prakash, Major Sdalbir Singh, Delhi Chief Minister Sheila Dikshit, Delhi Assembly Speaker Chaudhary Prem Singh, union cabinet minister Kapil Sibbal, MPs Jagdish Tytler, Sajjan Kumar, Krishna Tirath, Sandeep Dikshit, Delhi ministers, A. K. Walia, Dr. Yoganand Shastri, Raj Kumar Chauahan, Hroon Yusuf, Arvinder Singh Lovely and Mangat Ram Singhal, Leader of Opposition in the MCD Jai Kishan Sharma and all councillors and youth leaders. Addressing the party workers Aggarwal said that during last one and half years the people of Delhi had to face some difficulties but the Central and state governments worked towards finding lasting solutions to these problems. Various programmes would be chalked out to strengthen the party at the grassroot level in the national Capital to widen the party base. Ashok Gehlot said that the Congress party was moving towards the direction of achieving a big victory in the Delhi Assembly elections due at the end of 2008. Victory of the NSUI candidates in the Delhi University Student Union elections was a pointer to the Congress party's bright chance in the assembly elections. Under the leadership of Jai Prakash Agarwal the party was fully prepared to face a any kind of testing situation. Sheila Dikshit said that J. P. Aggarwal was a very important link between the old and new leadership of the party and it would be very easy and feasible for him to establish a better working relationship with them. In the leadership of Aggarwal the party would emerge victorious in the coming assembly elections, she hoped. This has lead to the scarcity of water supply in fields and the power plant. The Hindon barrage comprising eight iron gates was manufactured in the national workshop, in Roorkee in 1979-80. According to sources of the irrigation department, gate number 2 of the Hindon barrage collapsed suddenly at 3 am yesterday and the huge iron gate fell in the river. The water is daily discharged from Jani-Khatoli in Meerut in the Hindon river, which meanders its way via Ghaziabad. This water is stopped at the Hindon barrage and is released into the Hindon cut canal to the Hindon canal, Yamuna river, Badarpur power plant and Agra canal. About 1,50,000-cusec ft water is released from the Hindon canal daily. The irrigation department official pointed out that the ratio of poisonous chemicals had increased in the Hindon Canal water, which was coming from the up-stream. Besides, the increased water pressure contributed to the collapse of the barrage. A special team of experts and engineers has been summoned from Bareilly to repair the barrage, the official said. Water supply to the Badarpur power plant and Agra canal has been stopped from Delhi, which has also affected the irrigation of fields. According to A.K. Sagar, superintendent engineer of the irrigation department, Ghaziabad and executive engineer Prem Chand, their team is inspecting the Hindon barrage. Sandbags have been placed at the spot, where the barrage gates had collapsed, to stop the water flow. Water supply from Jani-Khatoli in Meerut has also been reduced. India has around 836 million poor people and has the worst maternal and infant mortality rates. Besides, it has the largest number of people without an access to education, according to the Oxfam. The Oxfam launched a global campaign, 'Health and Education for All' here today, calling for an investment of over Rs 6 million more on teachers, nurses and doctors around the world. The Oxfam urged governments of developing countries to allocate an increased proportion of their annual budget to provide essential services to people. It demanded that the rich countries should support poor nations with an increased and long-term aid commitment targeting health and education sectors. A press brief released stated that in India there is an advanced medical treatment available for the wealthy on one hand while, on the other hand, the maternal and infant mortality rates are worse than the sub-Saharan Africa. India has 'world class' economists, scientists, engineers, IT professionals, but it has the largest number of people without access to education. The report shows that India ranks eighteenth from the bottom among 177 countries, in terms of the percentage of the GDP that it spends on health. The report also shows that parts of India are progressing on essential services. Government's initiative in Himachal Pradesh, for instance, provides an outstanding example, where high rates of literacy have been achieved despite hilly terrain, lack of access to water, extreme weather conditions and poverty. Himachal's literacy rate was 19 per cent in 1951, which increased to 77 per cent by 2001. The report stated that state governments have invested in teachers, lower teacher-pupil ratio, more classrooms and fewer single-teacher schools. According to the Oxfam's 'Global for All' campaign released today, universal education and health is possible even in the poorest countries, if investments are made. 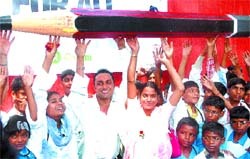 Actor Rahul Bose and classical dancer Geeta Chandran accompanied by nearly 300 children launched the campaign. Children were dressed like doctors, nurses and teachers to symbolise the 6 million health and education workers, which the Oxfam estimates are needed worldwide to provide basic health care and primary education. Around 1.5 million are needed in India alone. Dr Archana Kumar and Afsana, a teacher, both making a huge impact in underprivileged areas around Lucknow, helped in launching the campaign. "No child should die because of the unavailability of resources," said Dr Kumar, pediatrician at Chhatrapati Sahuji Maharaj Medical University, Lucknow. "The biggest problem is that it is difficult to manage such number of children," said Afsana, who teaches 175 children in the two-teacher Kassmandi Khund village school. the creative flair of these young writers by saying, "Some might well make it to the top in the coming years." The book is the product of an annual nationwide search by the Classmate Young Author Contest organized since 2003 by ITC Ltd. The 16 short stories selected in this book were shortlisted from 2,00,000 entries from India by an eminent jury headed by Ruskin Bond. Two of the winning entries were from DPS R K Puram students, Parth Krishna and Divyajyoti Das, both of Class XII. The short story "Standing on the Edge" by Parth Krishna depicts vividly the pitfalls, temptations and life of lies that the youth of today are exposed to. "Shadows from the Past" by Divyajyoti Das, teaches one how fear can affect one's rationality and that first impressions are not necessarily correct, a DPS release said. "Though we are pleased by the pronouncement of the new power minister, we would like to ensure that these are followed up with systemic changes and not ad hoc decisions or knee jerk reactions to issues," said Sanjay Kaul, president of the People's Action. "We are willing to work with Walia towards a better appreciation of the tyranny that consumers have had to face since the last five years, under the privatisation procedures", he added. President of the Ram Vihar RWA, V.N. Bali said that members would acquaint the minister with the current situation. "Our meeting with the DERC that was held a few weeks ago, will be followed by an attempt to meet the power minister. Our aim is to present a practical proposal, under which consumer redressal will be of paramount importance. The next thing on the agenda will be to seek methodologies to ensure greater accountability form the Discoms", he said. Varinder K. Arora of URJA East Delhi has faxed a letter requesting a meeting with the power minister led by the URJA functionaries from Delhi. "We have sought time from the minister to apprise him of our stand on various issues from the consumer's point of view, which has been ignored by the Delhi government," said Arora. There was nostalgia and more as the entire top leadership of the Communist Party of India (CPI) gathered at the Mavlankar Auditorium, here yesterday to watch 'AKG', a docu-fiction on one of the leading lights of the Indian communist movement. The Malayali film, directed by national award winner Shaji N. Karun, provided an occasion for the present day leadership to be reminded of their role in the "emancipation of the oppressed and the struggle against imperialism," CPI general secretary Prakash Karat said. Lok Sabha speaker Somnath Chatterjee, CPI general secretary Prakash Karat, politburo members Sitaram Yechury and Brinda Karat were among the ones, who watched the 70-minute film, which starts with a mundu-clad Karat introducing AKG to the audience. The film also features Kerala Chief Minister V.S. Achuthanandan, Kerala party secretary Pinarayi Vijayan and Chatterjee sharing their memories about the leader. Addressing the gathering ahead of the screening, Karat remembered how he as a young party worker learnt lessons from AKG. Chatterjee recalled the respect that the Marxist veteran earned in the Parliament, despite being a leader of a small party. "I wish MPs of today were told about how he conducted himself in the highest forum. What dignity even a leader of a small party earned because of his intrinsic commitment to people's issues," said Chatterjee. Born in 1904, AKG was an outstanding leader of the CPI and a member of the Lok Sabha for five consecutive terms from 1947 till his death on March 22, 1977. The film has scenes of AKG's encounters with Indira Gandhi, shot in the Parliament and his friendship with India's first prime minister Jawaharlal Nehru that was filmed in Teen Murti Bhavan. According to the Parliament officials, the Parliament was opened to cameras only twice, for Richard Attenborough's 'Gandhi' and Dr Jabbar Patel's 'Dr Ambedkar'. While noted artiste P. Sreekumar plays the role of AKG in the film, Shaji has chosen two National School of Drama artistes to play Indira Gandhi and Nehru. Archana, an upcoming television artiste, is the politician's wife Susheela Gopalan, who was the industry minister of Kerala. Kerala MP Lonappan Nambadan plays the role of former West Bengal Chief Minister Jyoti Basu and former Kerala Chief Minister E.K. Nayanar's role is enacted by his son, Krishnan Kumar. P. Karunanakaran, MP from Kasargode and AKG's son-in-law, said that the director had a tough job, as no video or audio of his famous speeches was available.a"It is unfortunate that we have not documented the realities of India and lives of these leaders. It was learnt that Oluwasegun Sesan would visit the Capital in a Go Air flight from Mumbai to supply cocaine. Sesan was nabbed at around 8 pm yesterday, in a dramatic way. 30 gms of cocaine was found from his possession. A suicide note was found from the site. "I have suffered trauma over my wife's relations with other men. I have lost the courage, to face the society," the victim's note read. The police alleged that the deceased's wife was pushing the two daughters into immoral activities, which bothered him. The police arrested Mahboob, Mahender, Bhurva and Munawar in Gulab Bagh yesterday. Information was received that the four men were present near the Roshanara Club Park, with an intention to commit theft in the area. A trap was laid and it was learnt that the alleged robbers were planing to raid trucks parked in the area of their goods. Following a tip off, the alleged gang was attacked and four accused were arrested while, one person Iqbal managed to escape. One country made pistol, one live cartridge, two knives and one rope were found from their possession. In another such incident, with the arrest of Parvez, Rajesh and Santosh, police claimed to have busted a gang of robbers and, hence, averted a robbery. Information was received that Parvez, who committed a murder in Okhla, would visit the DDA parking in Kalkaji. It was learnt that the alleged gang of criminals was planing to rob a house in Shambhu Dayal colony. Following a tip off, three accused were nabbed while, two escaped. Police recovered two knives, one iron rod, one torch and one piece of nylon rope. Mehra, who visited the gosadans to inspect the working of the NGOs after being informed that these were facing hardship in maintaining and feeding the cows .The grants had been held up following some petty objections.She held a meeting with the officials concerned and removed the objections.